He’s very concealed, Polanski. We became very close friends, but I don’t think I ever saw him drop his guard. I didn’t see him upset or anything like that, we just did the work. I mean he’s a very famous director… they’re not going to put their… and he’s very tough, he doesn’t like interference at all, so he kept them at bay. I went straight in. Fade in, one… whatever. He’s playing the piano in the radio station. No, I can’t write treatments, I think there’s a danger with treatments. That you… you write out your first excitement and enthusiasm in a prose treatment. Well we took it apart scene by scene. We examined every sentence, every full stop, every comma. He has a most wonderful eye for detail, Roman, and you know, he’s a very good artist. 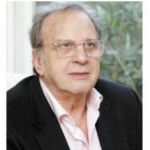 Sir Ronald Harwood is an author, playwright and screenwriter. He is most noted for his plays for the British stage as well as the screenplays for The Dresser and The Pianist, for which he won the 2003 Academy Award for Best Adapted Screenplay.